One of the ways we celebrated Mia's 9th birthday last year was with a monthly treat box. The boxes came full of goodies such as treats, toys and something for the owner, normally something practical for everyday use (you know what I mean). So when we were given the chance to review a monthly treat box from Yum.ee Pet Treats, we leapt at the chance. Knowing Mia, our very own treat connoisseur would be busy reviewing the Petzi treat cam and how much fun she and we had with her monthly goody boxes, we enlisted the help of Ming Ming the Pug. Ming Ming is owned by new mum and actress Sarah Jayne Dunn, who says Ming Ming is one of the biggest parts of their family. 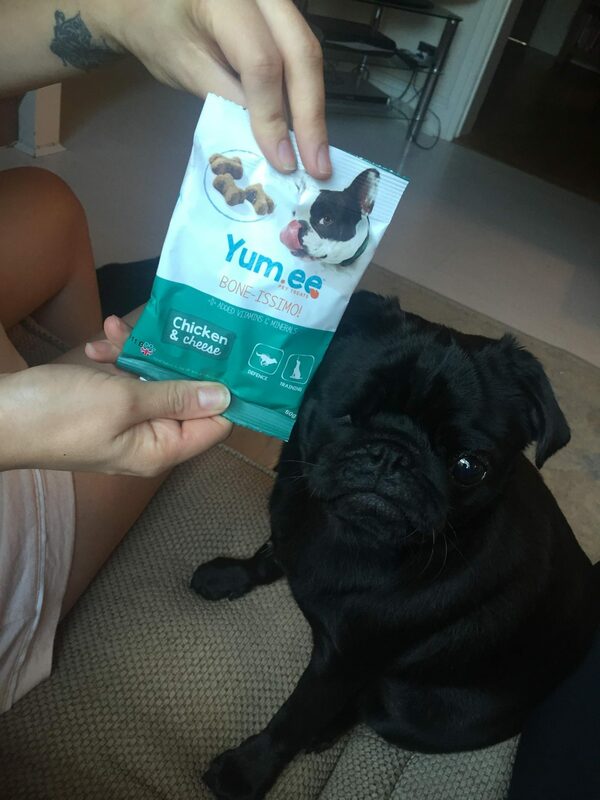 When K9 Magazine asked if Ming Ming would like to try Yum.ee Pet Treats for a month we jumped at the chance. Like any dog, Ming Ming LOVES a treat and we use them to train and reward her. She has to have eye drops three times a day in her remaining eye and a treat either side of application means that she actually looks forward to this ordeal instead of running away, so treats are invaluable. She also loves a bedtime treat as a good night token. The offer to try these home delivered treats coincided with Ming Ming’s annual trip to the vet’s for her booster. To our horror (but not surprise) the vet informed us that Ming Ming was clinically obese and needed to lose weight! Pugs are known for easily putting on weight and people often have the misconception that they are ‘rounder’ breeds, because of this we have always been very careful with the amount we feed her and the number/type of treats we give her, however we can’t control trips to the grandparents and the ‘treats’ they ‘don’t’ give her “honestly”. With a vet note in hand, we were given a month to help Ming Ming lose weight before she was able to be given her booster. A bad time to have a weekly treat box delivered was my instant thought, but after logging onto the Yum.ee website I was happily surprised. The treat boxes are tailored to your pet and you can set the frequency of your treat boxes also (weekly, fortnightly, every three weeks or once a month, for example). To get the right ‘prescription’ for your dog you just have to answer a few easy questions, breed, age, health conditions.....I was able to state that my dog was prone to obesity, bingo! The first Yum.ee pet treat box arrived within a few days and boy was Ming Ming excited. The boxes are personalised, small enough to be posted through your letterbox and jam packed with hand picked treat bags for your pooch. The treats are well packaged, look appealing and have lots of added vitamins and minerals to support your dog’s immune system. All hand baked in the UK with locally sourced ingredients. Ming Ming’s treat selection included ‘Light bite’ treats, perfect for her weight loss. Before we had a chance to even get through one bag of treats another Yum.ee box arrived for Ming Ming, each box is stamped with the name of the person that has packed the box, so far Lynz, Ines and Doug have prepared Ming Ming’s treats. All of the treat boxes are jammed packed with generous portions and every treat box has pleased Ming Ming greatly. So far, there hasn't been a treat that she hasn't liked. We have gone easy with the treats for Ming Ming to help with her weight loss and on her return visit to the vets she had lost weight, excellent news, she’s on the right track, even with a little treat here and there! I wouldn’t hesitate to recommend Yum.ee treat boxes. Having something so personalised, regularly delivered and with great nutritional composition tailored specifically for your dog is excellent and great value for money. The treats last for ages and if anything we have too many, but it's always good to have them in stock though! Thanks to Yum.ee Pet Treats for sending their tailored treat boxes to Ming Ming to review on behalf of K9 Magazine.